Thunder Over Louisville, the largest fireworks show in the world and the opening event for the Kentucky Derby Festival draws more than half a million spectators every year. Though the Thunder Over Louisville fireworks show can be seen all over Downtown Louisville, not every spot will be a great place to watch the show and hear the music. If you want to enjoy the annual fireworks show to its fullest, then you're going to need to know the best places to watch Thunder Over Louisville. It is definitely worth seeing, but Thunder is a busy day full of people, so make sure to attend prepared. Though there are many hotels on the riverfront strip that offer great views of the Thunder Over Louisville fireworks, the Galt House has the best placement for the show. If you're on a high enough balcony, the fireworks explode right in front of your eyes. Unfortunately, reservations for a riverfront room at the Galt House during Thunder Over Louisville are booked nearly a decade in advance, but any guest during the weekend gets access to the pool deck viewing area. Another great location to see the fireworks is in Jeffersonville, Indiana. Jeffersonville is on the other side of the Second Street Bridge, and traffic and crowds there are generally less condensed than on the Louisville side. Most of the areas on the Jeffersonville side of the Second Street Bridge are private property, though there are some good pedestrian areas on Riverside Drive. Some of the riverfront restaurants in Jeffersonville, like Portage House and Parlour Pizza, also offer reserved Thunder Over Louisville balcony tables for the show. To marvel at the show, but avoid dealing with the crowds or traffic, try the top of Iroquois Park. From that vantage point you can see all of the fireworks, and if you bring a radio, hear the music soundtrack as well. While the spectacle won't bee the same as watching it much more closely from a downtown location, it's a good alternative as a means of avoiding the other 500,000 Thunder spectators. If you're going to watch Thunder Over Louisville from the riverfront, then the goal should be to get as close to the Second Street Bridge as possible. Waterfront Park is one of the best places to watch Thunder Over Louisville—many vendors are there selling food and drinks, there are portable restrooms around every corner, and you'll be able to hear all of the Thunder Over Louisville music and Air Show commentary. 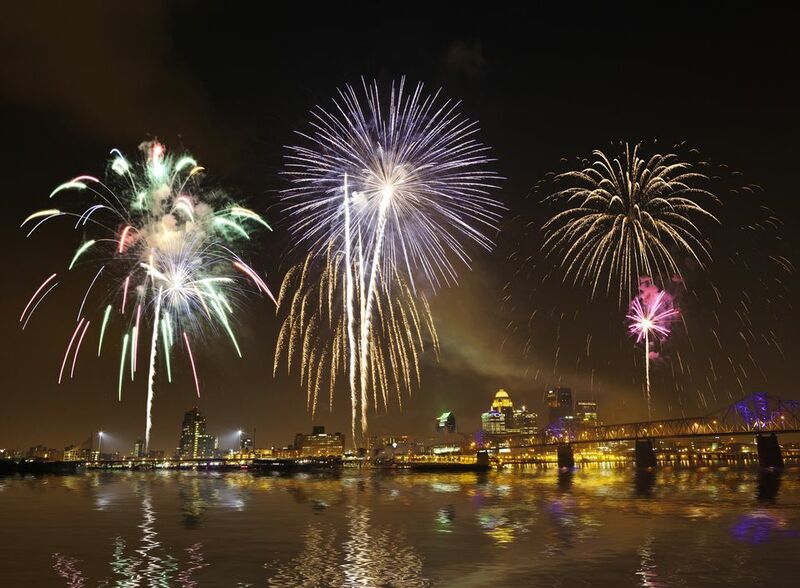 If you prefer a smaller crowd, private restrooms, and catered food and don't mind spending some money on these amenities, then a Thunder Over Louisville special event is probably the best choice for you. These bashes are hosted all over Kentuckiana by restaurants and businesses close to the river. Places like the Sheraton Louisville Riverside Hotel and Joe's Crab Shack have had annual parties for years and ensure guests have a great time, while there are even less formal locales like a VIP gala on a parking garage rooftop.